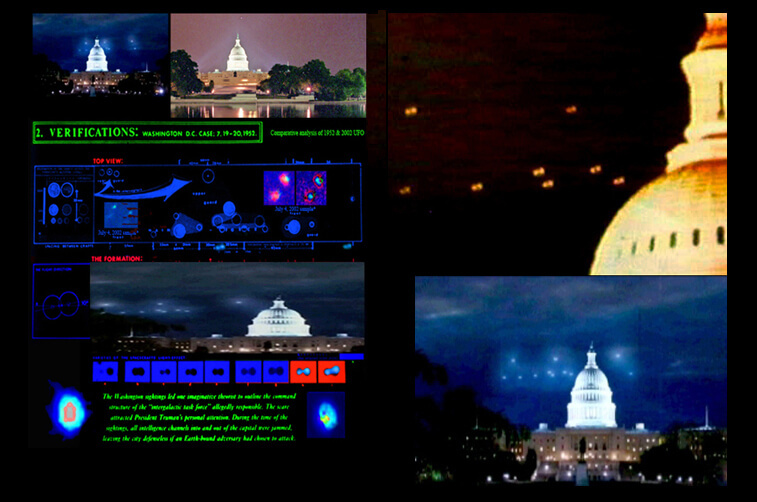 There is a ton of UFO sightings and reports around the Washington D.C area that occur almost weekly. People are always reporting seeing strange lights in the sky, unusual noises, Or F-15 fighter jets chasing distant object. This in itself is odd since most of Washington D.C. flyovers require specific permissions. So, what is it that these people are seeing? Are they extraterrestrial? Are they secret government craft? No one knows for sure. But, there is one story involving the unknown craft swooping over the skies of Washington D.C that is still in controversy today. At about 11:45, on a warm summer’s day on July 19th, 1952. The capitol was winding down for the night, lawmakers and senators were home with their families. Little did they know the buzz and fear that was about to grip this great nation’s capital in a matter of moments. All of a sudden at the Washington D.C. radar station a young air traffic controller started getting pings on his screen. The pings where coming from only about 20 miles away and were getting closer very rapidly. The air traffic over Washington is suspended everyday past 10 o’clock, so no planes were supposed to be in the air. He contacted his supervisor that was on duty Harry G. Barnes. Mr. Barnes came into the control room and watched as the object zoomed at incredible speeds at angles of near 90 degrees. At times, it moved so fast it would even disappear from radar for a moment, only to be picked up again on the opposite side of the city. Barnes has been an air traffic controller for quite awhile, and he knew of no aircraft that could begin to make the maneuvers he was seeing on his screen. So, he contacted central tower and Andrews’s air force base. Both were picking up the same object. The airmen at Andrews’s air force base started calling in because they were witnessing a “bright orange object” Circling an area of the sky and then taking off in another direction. They had never before seen an aircraft do such highly unusual maneuvers. The reports kept coming in from all over the Washington area about this unusual object in the sky until the early morning hours of July 20th. The very next day he radar started to ping again at almost the same time. Again it was observed doing impossible acrobatics that a normal aircraft could never do. It was flying at an unprecedented average speed of 5000 mph while doing these maneuvers. Then it was gone as quickly as it came. To prevent any more of these unexpected intrusions into the national airspace combat jets for the next week surveyed the skies around Washington D.C. No, additional sightings were reported until the following weekend. The jets that were on the ground and in the sky were scrabbled t intercept the intruder, which was refusing to identify themselves. As the fighter jets started on an approach path directly for the object, the object decided to intercept the jets that were incoming. The pilot of one of the jets identified as Lt. William Patterson was stunned and immediately requested permission to fire on the objects. His request was only met with a silent radio, As the ground crew watched as the objects went around and around the planes. After what surely felt like an eternity the pilots were finally relived hen the objects flew off at an incredible rate of speed in a different direction. Immediately the Air force called in Captain Edward J. Ruppelt who was ahead of Project Blue Book at the time. He was briefed on the incident soon after the pilots intercepted the unknown objects. But, a lot of his questions went unanswered as the air force simply refused to provide any. After harry Truman, the president at the time was made aware of it. An explanation was forth coming but only in the aspect of being weather related. Witnesses to the event were stunned at the controversial claim of air formations. But, being this was the given theory and no one else was talking little could be done. This was one of the most famous of Washington D.C incidents that still remains in project bluebook files as completely unexplained.